Viewport is 16:9 by default, with non-16:9 aspect ratios being anamorphic. Use Jackfuste's patcher (16:10, 5:4 and 4:3) to remove black bars. Automatically detected and activated on supported displays. No in-game Enable/Disable setting. Will disable upon Alt+Tab and requires a restart to reactivate. 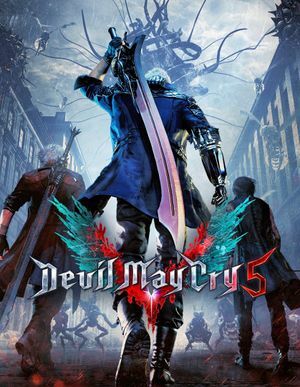 Download Devil May Cry 5 3D Vision fix. Extract its contents to the installation folder. F5: vignette toggle. Disabled by default. 4: depth of field toggle. Not disabled by default. 5: barrel distortion toggle (better not use chromatic aberration). Disabled by default. 6: temporal anti-aliasing (TAA) toggle. Enabled by default. 7: radial blur (it happens with the running fast skill) toggle. Not disabled by default. Find and disable device labeled "HID-compliant vendor-defined device"
There may be more than one device with that label. Try disabling one by one to see which one is causing the issue. When you reopen the game after you have disabled the device, the infinite scrolling shouldn't happen after using Steam Overlay. Download and install Rivatuner, add DevilMayCry5.exe and limit Framerate to desired fps. Go to your \SteamLibrary\steamapps\common\Devil May Cry 5\ folder. Devil May Cry .ini has a distinct option for Lens Flare. (Lens flare may be used in other places in cutscenes, however the writer hasn't noticed any changes). Go to Steam\steamapps\common\Devil May Cry 5\. Contact shadows will be used during gameplay, not just for the cutscenes. ↑ 2.0 2.1 File/folder structure within this directory reflects the path(s) listed for Windows and/or Steam game data (use Wine regedit to access Windows registry paths). Games with Steam Cloud support may store data in ~/.steam/steam/userdata/<user-id>/601150/ in addition to or instead of this directory. The app ID (601150) may differ in some cases. Treat backslashes as forward slashes. See the glossary page for details.